By Reza Zarghamee In Kindle & iPad Tagged In 6th Century, East, History, Iran, Iranian, Middle East, and Persian. Available for the Kindle & iPad, or in a Hardcover edition. The Kindle edition of Discovering Cyrus is an exact reprint of the printed book and can be viewed using Kindle Fire as well as on the iPad using the Kindle app for iPad. The iTunes iBook edition of Discovering Cyrus is a fixed format digital edition of the printed book, which matches the pages number but the type is digital, which means the hyperlinks are live. Some of the most fascinating human epochs lie in the borderlands between history and mystery. So it is with the life of Cyrus the Great, founder of the Persian Empire in the sixth century B.C. By conquest or gentler means, he brought under his rule a dominion stretching from the Aegean Sea to the Hindu Kush and encompassing some tens of millions of people. All across this immense imperium, he earned support and stability by respecting local customs and religions, avoiding the brutal ways of tyranny, and efficiently administering the realm through provincial governors. The empire would last another two centuries, leaving an indelible Persian imprint on much of the ancient world. The Greek chronicler Xenophon, looking back from a distance of several generations, wrote: “Cyrus did indeed eclipse all other monarchs, before or since.” The biblical prophet Second Isaiah anticipated Cyrus’ repatriation of the Jews living in exile in Babylon by having the Lord say, “He is my shepherd and will accomplish all that I please.” Despite what he achieved and bequeathed, much about Cyrus remains uncertain. Persians of his era had no great respect for the written word and kept no annals. The most complete accounts of his life were composed by Greeks. More fragmentary or tangential evidence takes many forms – among them, archaeological remains, administrative records in subject lands, and the always tricky stuff of legend. Given these challenges, Discovering Cyrus: The Persian Conqueror Astride the Ancient World is a remarkable feat of portraiture. In his vast sweep, Reza S. Zarghamee draws on sources of every kind, painstakingly assembling detail, and always weighing evidence carefully where contradictions arise. He describes the background of the Persian people, the turbulence of the times, and the roots of Cyrus’ policies. His account of the imperial era itself delves into religion, military methods, commerce, court life, and much else besides. The result is a living, breathing Cyrus standing atop a distant world that played a key role in shaping our own. Westerners know ancient Persia mostly through the eyes of its enemies, the Greeks. For that reason, our view of the Persians is largely colored by that relationship: We generally see them as militaristic, imperial, cruel and exotic-like the caricatured emperor Xerxes in the movie The 300. This book is about Xerxes’s grandfather, Cyrus the Great, whom even the Greeks acknowledged as an exceptional leader. Xenophon’s Cyropaedia (Education of Cyrus) cites the progressive, humanitarian statecraft of Cyrus, portraying him as an ideal prince. This Greek work was quite popular in r8th-century Britain and America, and copies survived in Thomas Jefferson’s library. 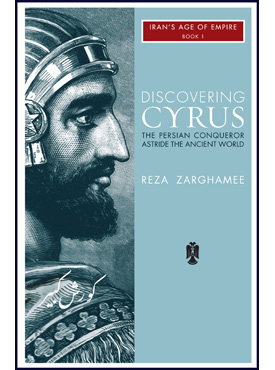 Zarghamee goes far beyond the Cyropaedia, tracking down just about everything known about Cyrus and shaping it into a well-written narrative of his life. Cyrus’s military achievements were indisputable: He built a standing army out of the Persian tribes and conquered foes including the Babylonians, creating the Achaemenid Persian empire. But he was more than a general. Cyrus showed great tolerance of other peoples and faiths. He allowed the exiled Jews of Babylon to return toJerusalem and rebuild their temple. His life is worth studying, as Zarghamee ably shows. —Dr John Curtis, OBE, FBA, Keeper of Special Middle East Projects, The British Museum. —Richard Frye, Professor Emeritus of Iranian Studies, Harvard University. Q: What drew you to ancient history as a teenager and to Cyrus the Great in particular? A: Because of the Iranian Revolution of 1979, my family relocated to Boston, Massachusetts while I was still an infant, and for a few years while we were settling in, many of us lived in the same house – my parents, my younger sister, three grandparents, two half-sisters, and me. My grandparents could not speak English very well and were religious and not very interested in pop culture, so, aside from the evening news, the only television programs that they enjoyed were Christmas and Easter specials like the Ten Commandments and Ben Hur. So that was one source of my interest. I also remember being in the fifth grade when the Boston Museum of Science hosted an exhibit on Ramses II, and I recall being astonished by the grandeur of the artifacts, particularly this one large statue of the pharaoh called the Colossus of Memphis. I then became very interested in the history of ancient Egypt, and from there, I gravitated toward the history of my homeland, Iran. Cyrus fascinated me because he received favorable treatment in the books I read. As an Iranian ex-pat, this was very striking, given that most Americans during the 1980s had a rather negative impression of Iran, stemming from the Hostage Crisis and the fatwa against Salman Rushdie. At first, I was curious about Cyrus’ unprecedented military conquests – the empire he founded was almost four times vaster than the largest state to precede it – but as I dug deeper, I increasingly admired his progressive and humanitarian approach to statecraft. It also became apparent to me, relatively early on, that, despite Cyrus’ good reputation, his story had been told only in broad brush and from a Western perspective. In other words, he was generally presented as an important yet secondary character operating along the fringes of the classical and biblical worlds. Q: What relevance does Cyrus have to modern times? A: Cyrus’ story is interesting because almost everything we know about him comes from the historical writings of the foreign nations that he brought under his sway (or that he and his successors tried to bring under their sway), so the positive memory of him in these sources attests to his ability to unite so many different peoples within a single “global” state without engendering animosity or resentment. This is relevant to modernity, given that globalism, along with democracy, represents one of the most important sociopolitical concepts of the present-day. Cyrus was an absolute monarch, with all that that probably entailed; but his rule was remarkably tolerant compared to that of many leaders that came before and after him, and this enabled him to rule over his vast domains with what has been termed an incredibly modest exertion of force. The fundamental hallmark of his statecraft entailed the acceptance of cultural diversity and not just the toleration of foreign customs but a strong interest in understanding them and trying to relate to his various subjects in terms of their own languages and beliefs. He also went out of his way to retain local political institutions and social groups in the lands he conquered. One recent study published by Yale Law School has concluded that the most successful plans for bringing peace to the global community involve “[harnessing] the self-interest of ruling elites in the communities of the world.” This conclusion is based primarily on an analysis of twentieth century history, but it gets to the point of what Cyrus did twenty-five centuries ago. Q: What were Cyrus’s views on human rights? A: The concept of human rights did not exist at Cyrus’ time, which was in some ways more brutal than the world we live in today. However, Cyrus stands out among ancient rulers in his clemency toward vanquished enemies, whom he customarily spared, and the great pride he took in achieving his conquests with minimal bloodshed. For example, in his famous Cylinder inscription, which recently toured several U.S. museums, he boasts of conquering Babylon without a battle and of prohibiting his soldiers from terrorizing the inhabitants of that city or from interfering with the daily religious activities of the Babylonian temples. There is a sharp contrast here with the inscriptions of previous Near Eastern kings, particularly the Assyrian and Babylonian emperors, who boasted of torturing, maiming, and killing their adversaries, and of leveling enemy cities and salting the earth. Cyrus also seems to have recognized the resentment caused by the longstanding practice of uprooting conquered populations from their homelands in order to break their national identity. Cyrus, in fact, is famous in the Hebrew Bible for authorizing the return of Jewish exiles whom the Babylonians had deported from Jerusalem and of funding the reconstruction of Solomon’s Temple, which Nabuchadrezzar II had destroyed. In many ways, Cyrus’ reign marked the beginning of the movement away from the more brutal forms of conquest and rule favored by earlier empires toward a heightened consciousness in statecraft. Q: What influence did Cyrus have on biblical history? A: As mentioned, Cyrus freed the Jews from Babylonian captivity, and his compassion in this regard made him a venerated figure in the Hebrew Bible. The anonymous prophet known as Second Isaiah, who was a contemporary of Cyrus and whose compositions are included within the Book of Isaiah, hailed Cyrus as the “Messiah,” or “Lord’s Anointed,” and regarded the Persian king as a savior. Most people today are unaware that Cyrus was referred to in such terms over five centuries before Jesus. It is also interesting that this same prophet, Second Isaiah, was the first biblical author to speak of God in unequivocally monotheistic terms and to emphasize God’s creative capacity (according to some scholars, the opening chapters of the Book of Genesis were revised to align with Second Isaiah’s utterances about God the Creator). During the period of Persian rule heralded by Cyrus’ conquests, the Jewish conception of God changed, as many of the doctrines that later became a hallmark of Christianity began to attain prominence in religious thought – e.g., God’s creation of the cosmos, the dualistic opposition between God and Satan, the belief in an apocalypse and final judgment, and post-mortal reward and punishment based on one’s actions during life. Before entering Judaism, these doctrines were of fundamental significance to the Iranian religion of Zoroastrianism, a form of which Cyrus likely espoused. Q: What influence did Cyrus have on the founding of the United States? A: Three students of the famous Greek philosopher Socrates are known to have praised Cyrus in their writings: Xenophon, Antisthenes, and Plato. The first two – Xenophon and Antisthenes – wrote treatises on the ideal state based on the figure of Cyrus. Of these treatises, Xenophon’s Cyropaedia, or Education of Cyrus, is the most substantial and the only one to survive. The Cyropaedia is a complex work that blends together genuine history with romance and Greek political philosophy. Cyrus appears throughout the work as the ideal prince, and because the Cyropaedia has long been considered one of the masterpieces of classical literature, it was deemed “required reading” for Western intelligentsia throughout the eighteenth century. It was in this context that the U.S. Founding Fathers had access to it, and copies of the Cyropaedia have been found in Thomas Jefferson’s personal library. It is possible that some of the Cyropaedia’s dialogues concerning just rule left an imprint on the minds of Jefferson and his colleagues. Q: You are an attorney by day, what possessed you take on the very time-consuming task of writing the first modern biography of Cyrus the Great? A: Quite frankly, Cyrus’ story deserves to be told, in detail and with attention, and this has not really been done until now. If you look at the Greek and Roman classics, the names of three great political leaders consistently stand out – Cyrus, Alexander, and Caesar. The lives of Alexander and Caesar are very well documented, but Cyrus has not received the requisite attention, perhaps, in part, because he was a Persian and, therefore, an outsider to the Western historical tradition. Consider that Americans nowadays see a movie like The 300, which plays upon the longstanding Western predilection to glorify the way in which a handful of Greek city-states repulsed a Persian invasion led by Cyrus’ grandson Xerxes. The tendency in America (and other Western countries) is to self-identify with the Greeks in that struggle. But what is interesting and perhaps appropriate for us to consider is that today, in its size, cultural diversity, and global influence, the U.S. is a superpower actually quite similar to the Persian Empire of twenty-five centuries ago. So there are lessons to be learned from studying the history of the Persian Empire, as well as in considering the life of its founder, Cyrus, and the attributes and circumstances that made him so successful.